Happy Monday! Yes, happy. Let’s try to make it that way. I had a great weekend and a lot of marvelous things to share with you over the next couple of days. Let’s get down to it. It’s no secret to regular readers that I am a huge fan of the restaurants of Max Restaurant Group. Two locations, Max Fish and Max Amore, are even in my hometown. Talk about convenient! 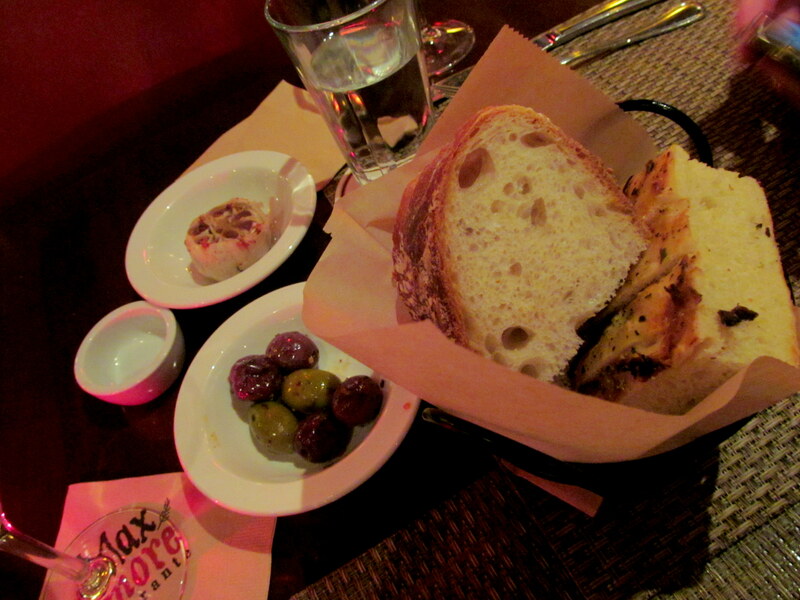 But can you believe it – I had only been to Max Amore one time, back in June 2007, for my high school graduation dinner. And to be honest I don’t even count that visit, because I wasn’t a foodie and was still an extremely picky eater. I’m pretty sure I ordered pasta with butter. Maybe there was plain grilled chicken involved. View from our cozy corner booth table for two. 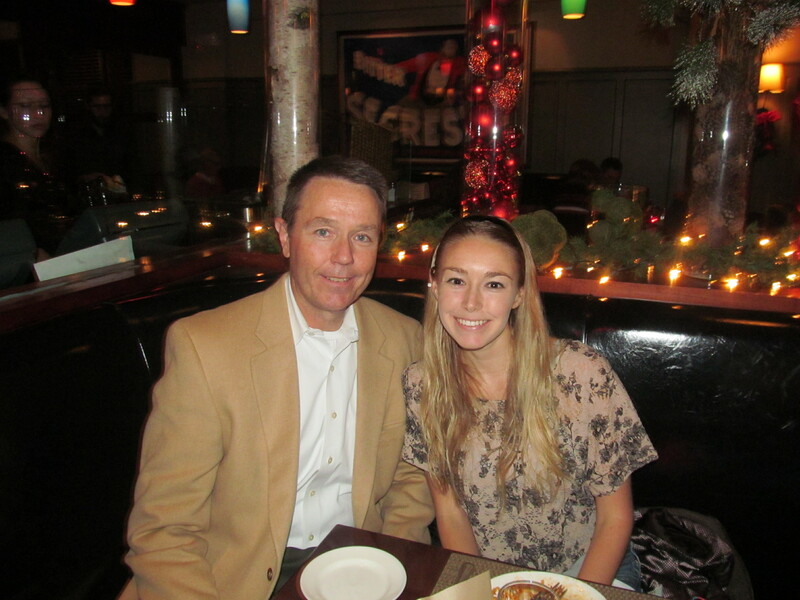 My dad suggested that we go out to a special father/daughter dinner this past Friday night, so I selected Max Amore. I am still trying to check all the Max restaurants off my list so of course this presented a perfect opportunity to do just that. 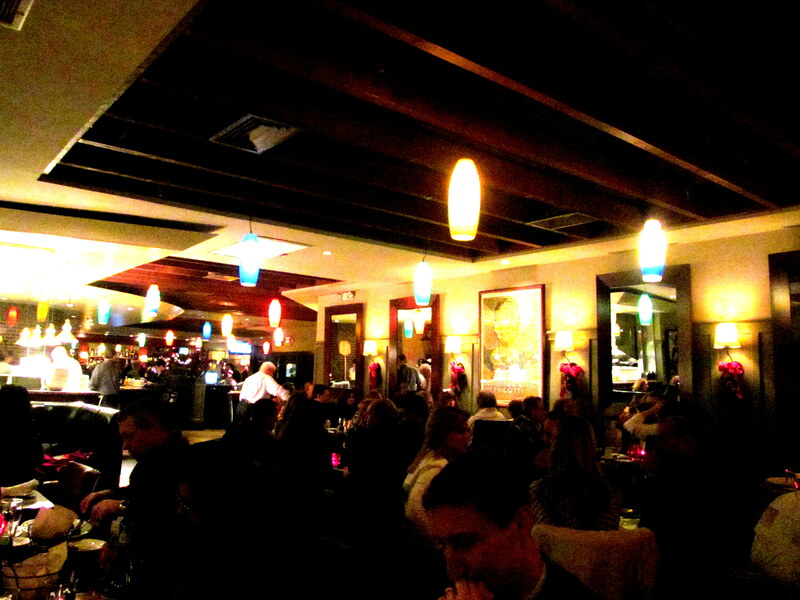 I was glad I made us a reservation – we were seated promptly upon our arrival but it was very crowded. I wouldn’t be surprised if we wouldn’t have been able to sit until way later with no reservation. 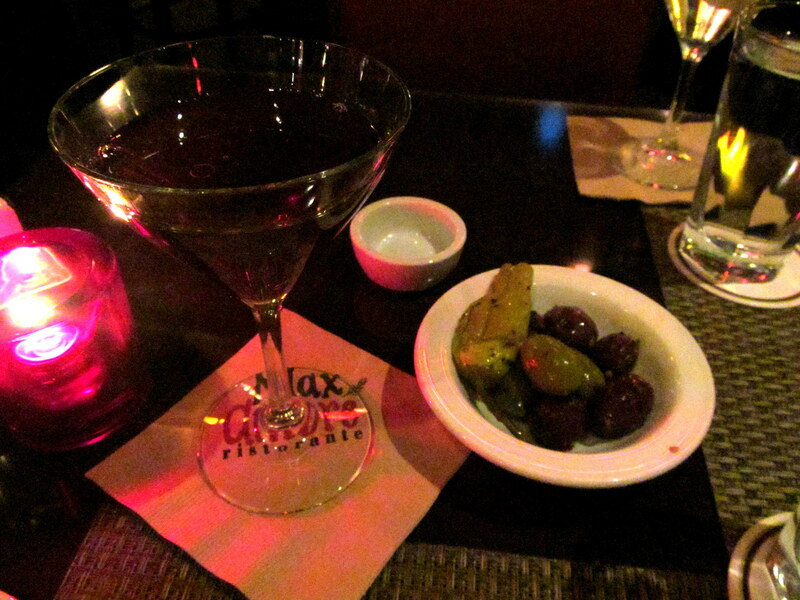 Big Boy Manhattan and olives. Being predictable old me, I ordered a Big Boy Manhattan (Old Fitzgerald bourbon, Cinzano rosso, Regan’s orange, Angostura aromatic bitters) from the impressive drink menu. Max restaurants have FABULOUS cocktails. I simply cannot visit a Max restaurant and order wine instead; it’s a waste. We also got some warm olives as soon as we sat down which was quite nice because I’d come from the gym and was ready to chow. The manager, Mark Conley, was kind enough to stop by our table to introduce himself and point out a couple of the evening’s most fabulous specials. 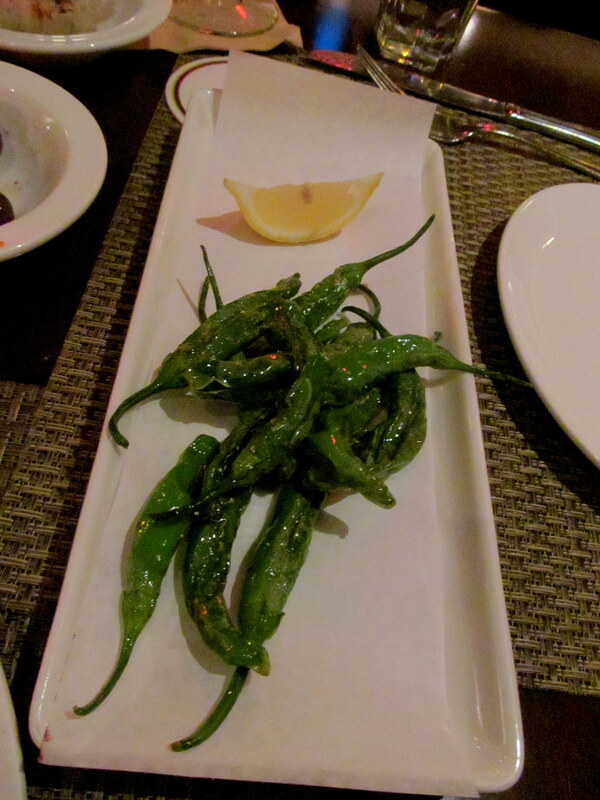 First, he suggested a “fun” appetizer, the Peppers alla “Scottadito” (blistered shishito peppers, lemon, sea salt). Originally grown in Japan, one in ten shishito peppers is spicy…that’s what Mark meant when he called them fun! You never know what you’re gonna get with those little guys. 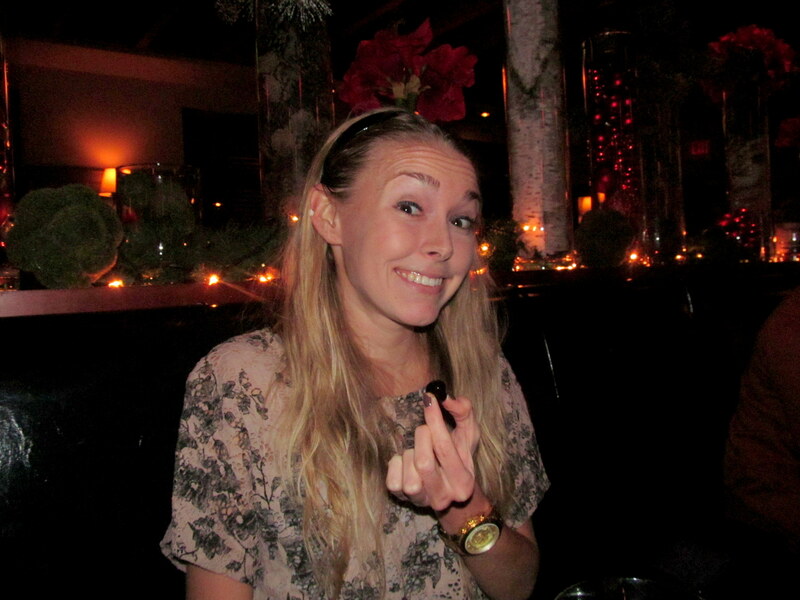 I naturally LOVED the idea of the app and ordered it right away. The spicy peppers weren’t so spicy that I was dying, but they definitely were recognizably different than the sweet peppers, which I could have eaten a boatload of. The lemon and sea salt were the perfect accompaniments. They look a little scary don’t they? 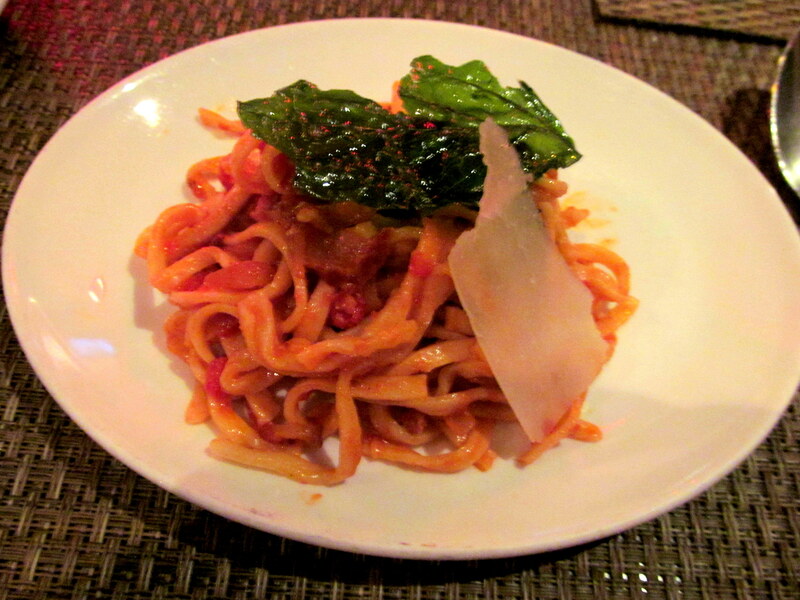 Mark was also kind enough to send out a complimentary sample of house-made Linguine all’Amatriciana for each of us. Amatriciana is the sauce and it is traditionally paired with Bucatini, a thick hollow spaghetti. Apparently there are debates surrounding the recipe and the “proper” way to make the sauce. Whatever the proper way, I can’t imagine how much better it could taste than the Max Amore version. You guys know that I’m not head over heels for pasta, but the sauce was so very flavorful and I could seriously tell the difference between this homemade pasta and the boxed stuff. I certainly savored every bite. And check out the fresh cheese! Mark also told us about the very rare certified Piedmontese grilled ribeye available as one of the evening’s special entrees. This breed of cow has an inactive myostatin gene that leads the beef to have less marbling and surface fat. Ribeye isn’t usually my steak of choice because of that very marbling, so my ears perked up – a steak lean enough for my taste that isn’t a filet? My dad was immediately all about it, and I was relieved to hear that I’d have a chance to sample this special beef. Our waiter, Joe, was honest with us and told us that the spaghetti squash the ribeye came with was good, but he preferred other veggies. I appreciated the tip and so did my dad, who is honestly not a spaghetti squash kind of guy. He asked for asparagus instead. While we waited for our entrees, I snacked on the crust of the above foccacia bread (the basket included regular Italian bread too). Instead of olive oil or butter, Max Amore serves GARLIC, which I squeezed plenty of onto my bread crust (and entree later). Oh garlic, how I adore thee. Me and my friend the brandied cherry. The Big Boy Manhattan disappeared in very little time at all and the only upside of that was the fact that I could have the brandied cherry at the bottom of the glass. Manhattans are a win, but when they come with that special brandied cherry they’re a champion. I hope that sentence made sense…ha. My dad got a Manhattan too and let me have the cherry. I had planned to order swordfish, but as soon as Joe told us about the mahi-mahi special, I was sold. 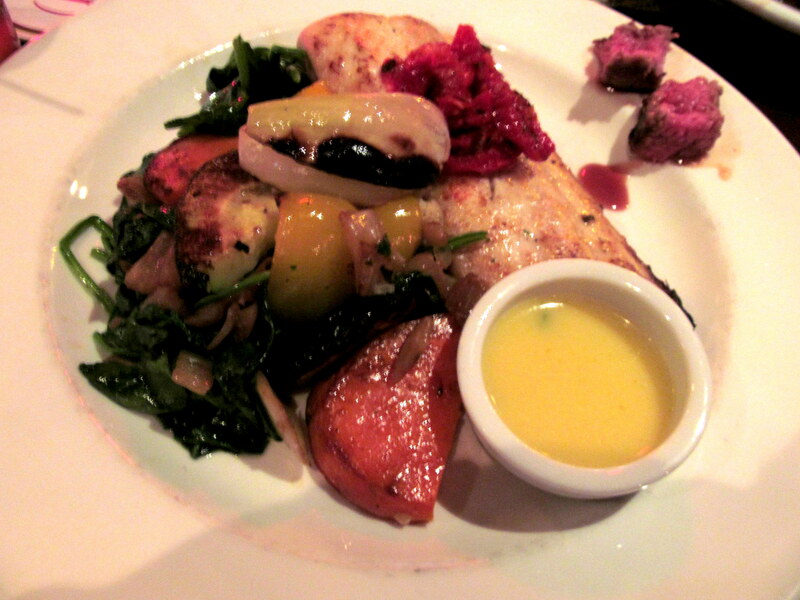 Mahi-mahi holds a special place in my seafood-loving heart because it was my “first fish”. I like to call it the “gateway fish”…I recommend it to those who like chicken but are hesitant to try seafood. This mahi was pan-seared and topped with a sundried tomato tapenade, served alongside braised fennel, baby spinach, and a roasted veggie medley (I asked for the latter instead of the potatoes it came with). I also asked for the lemon butter sauce on the side and the whole shebang arrived just as I’d requested. I’m glad I asked for the sauce on the side because while it was pretty good, it really was not needed. This fish had plenty of flavor on its own and was cooked perfectly. The oil on the veggies was delicious but not so much that their taste was covered up. I can also appreciate the large portion of fish! I finished every last bite of my meal (but did trade bites of fish to my dad for his Piedmontese ribeye). 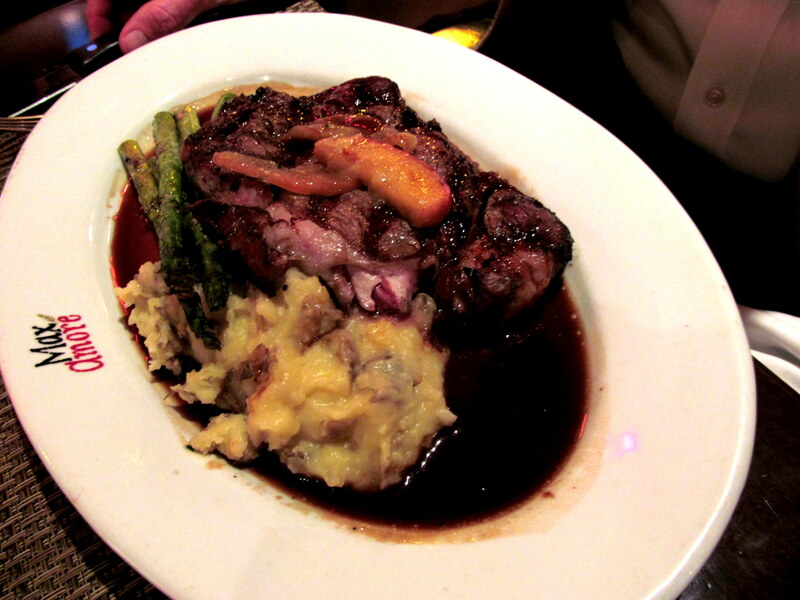 Piedmontese grilled ribeye, asparagus, whipped Yukon potatoes, caramelized apple jus. How AMAZING does this ribeye look?! The steak tasted fabulous. The best ribeye I’ve ever sampled, and the sauce, oh yum! I had to mop up its remnants with more bread crusts! A particularly epic bite I had was a combo of the steak and those creamy Yukon taters. Oops – forgot to take this pic til I was halfway done! 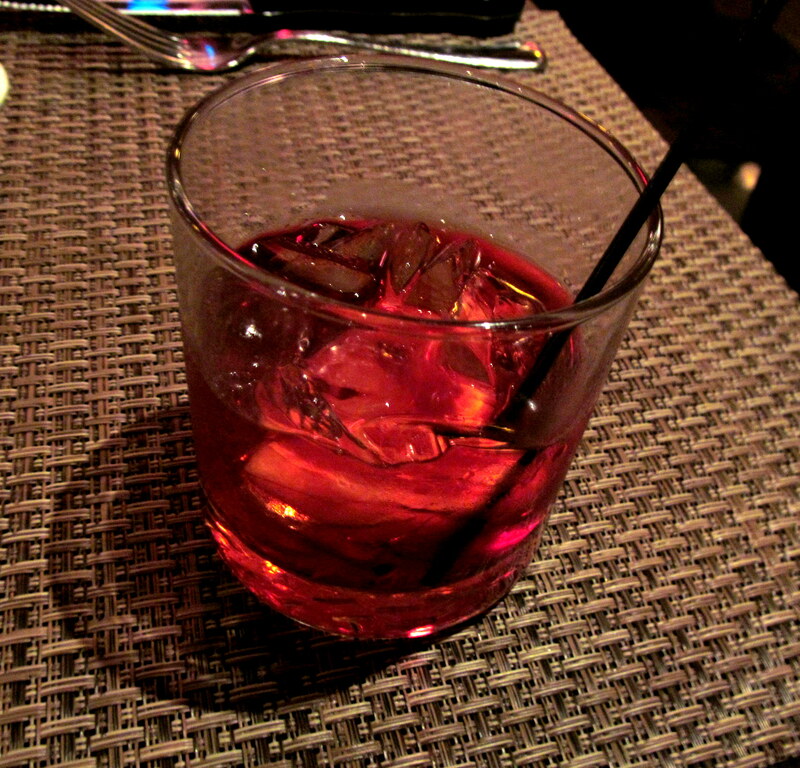 To go with my meal (okay, maybe not “go with” my meal since these don’t really pair well with many foods) I ordered my second-favorite (recently decided this) kind of cocktail, the Negroni (Beefeater gin, Campari, Cinzana rosso). I didn’t realize it’d be served with ice (not sure if they usually are) and wish I’d ordered it up, but other than that it was perfect and just as I’d imagined it’d be. Leftover Italian pastries from Mohegan Sun’s Tuscany were in the freezer at home calling my name, so my dad and I skipped dessert and opted to head home after we’d finished our food. But first, Mark was kind enough to introduce me to the executive chef, Ted Burnett. He’s worked in several Max restaurants and was a really nice guy! He even told me a story (that he apparently tells everyone) about a woman searching throughout Italy for the perfect lasagna. What’s your favorite dish to order at an Italian restaurant? Have you ever heard of the shishito peppers and/or the Piedmontese beef? What was your best meal of this past weekend?